Yup, you read that title correctly. Clean off your glasses and rub your eyes all you want, the Boston Bruins will be representing the Eastern Conference and winning the Stanley Cup Finals. This is not a joke, so stop snickering at your phone or computer, wipe that smirk off your face, and listen up (I’m sorry, was that too mean?). Currently, the Bruins are second in the Atlantic Division and third in the Eastern Conference. They are riding a ten-game point streak and have gone 8-0-2 in their last ten games. The team is seventh overall in the entire league and is a far cry from how it was doing during the first couple months of the season. The Bruins head into their bye week with a 27-10-7 record and own 53 points. From the opening game on September 18th, 2017, until the end of November, the Bruins managed to earn 26 points in 23 games (1.13 points/game). From December 1st to the present day (January 9th), the Bruins have earned a remarkable 27 points in 17 games (1.59 points/game). What can be attributed to this turnaround? The play of Tuukka Rask and the otherworldly production from the Bruins top line is thriving as of late, but the rest of the roster is nothing to sneeze at (bless you). The Bruins, on paper, are not the most star-studded crew in the National Hockey League. Sure, they have the most dominant top-line in the league with Brad Marchand, Patrice Bergeron, and David Pastrnak, but after that, the rest of the players are not household names. The Marchand, Bergeron, Pastrnak line leads the league with the least number of even-strength goals allowed by any line with only one goal allowed. Bruce Cassidy might as well pull Tuukka or Anton Khudobin every time this line is on the ice because their opponent will simply not score. Individually, these three have combined for 111 points on the season, which is approximately 39% of the total points the entire Bruins team has put up this year. That’s not to say the rest of the team are a bunch of slouches, either. This team is truly a great mix of veteran talent with young players who are fun and exhilarating to watch. The Bruins have phenomenal talents in rookies Charlie McAvoy (2nd in time on ice on the team), Danton Heinen (30 points), and Jake DeBrusk (leads the team in game-winning goals with three). Nothing gets the juices flowing more than fast and exciting play, especially from rookies who bring new life to this team. 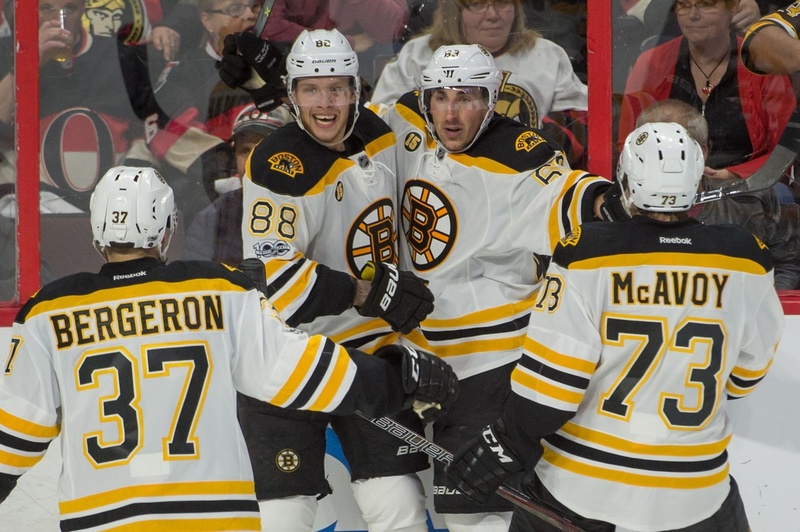 The Bruins knew when they got these guys that it might take a few years to develop their skills; however, these three rookies, in particular, are playing beyond their years and make watching the Bruins a true joy. McAvoy continues to see 22-23 minutes a night and will soon pass Zdeno Chara for the most time on ice on the roster. Heinen, since November 1st, has put up 18 points in 17 games which is just outstanding for any player, let alone a rookie. DeBrusk has proved he has the capability to play well alongside fellow youngster Ryan Spooner and skilled-veteran David Krejci. Just How Good Is This Team? Based on the title, I assume most people believe that this article was just clickbait (spoiler: it’s not). This Bruins team is special and I wholeheartedly believe that they will be in the hunt for the Cup when summer comes around. Yes, you are seeing this correctly: the Bruins are scoring the most and also giving up the least amount of goals in the league over the past month-plus. Now, sure, a lot can change between now and the end of the regular season. This team is undoubtedly playing its best hockey of the season so far, but who knows just how great this team can actually be? Some reassuring information to know is that this team was playing without its top players on a consistent basis at the beginning of the season and now this team has its lines essentially cemented on a night-to-night basis. This team began playing their best once everyone was healthy and they have not really slowed down since. And How Far Can They Go? On paper, this team should be bounced in the first round of the playoffs. The roster from the previous season has only been slightly improved, but this team is playing better than that stinking piece of paper. Last year, when Bruce Cassidy took over for Claude Julien, there was an instant change in pace-of-play, breakouts, schemes, etc. With a full off-season to practice together under Cassidy’s system, this team is showing that they can play with speed and skill and can also hang with the best teams in the league. The Bruins are on their league-mandated bye week and don’t return to action until Saturday, January 13th against their all-time rival Montreal Canadiens. I am sure expectations about this team will be readjusted throughout the remainder of the season, but this team deserves the region’s and the country’s attention. The Bruins, with the way they can play and the efforts they get from both goaltenders on a nightly basis will, in fact, compete for the Stanley Cup in 2018. In fact, I’d say they have a great chance to bring the Stanley Cup back to 100 Legends Way in Boston, MA. You heard it from me loud and clear: the Boston Bruins will be winning the Cup Finals come June. Book it. Feel free to tweet me your disagreements @aaroncomak on Twitter. Just sayin': Last time Bergeron had a hat trick the team won the Stanley Cup. Last time the Bruins had a game PPD due to snow prior to this week was '13 when they reached the finals.